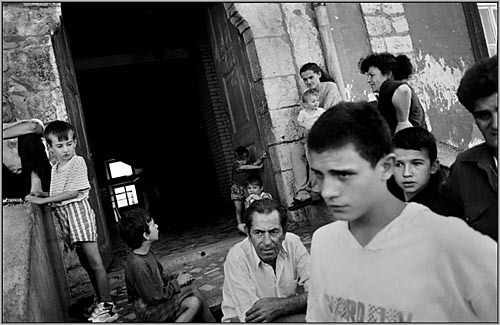 The return of the purged ethnic Albanians in the summer of 1999 to their homes in Kosovo was not always peaceful. No longer protected by the Serbian military, Serb villagers found themselves attacked by angry Albanians who flooded back into Kosovo in droves once the Serbian army was forced out. In Prizen, an old city in southwest Kosovo, some returning ethnic Albanians began torching Serbian homes in the area, as well as harassing Albanians and Gypsies who were thought to have helped the Serbs. In Bagoslavia, a walled Serbian Orthodox seminary in downtown Prizren, 22 ethnic Albanians, 11 Gypsies, and around 150 Serbs took refuge.